Scents are a constant flow of infatuations for me, but every now and then something comes my way that really takes my breath away. Not that often though. I like many many perfumes, I love several. But then there is another level and when that happens it is magic. 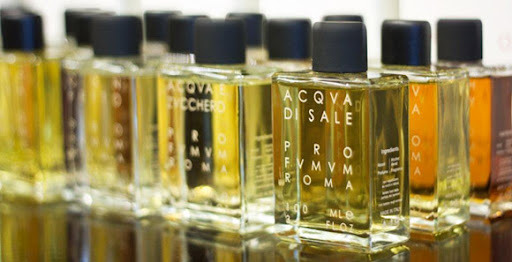 Recently I tried several perfumes from Pro Fvmvm. They are all exquisite but one of them was instant love. I have many feelings related to this particular perfume (I have decided not to tell you which one it is, as I wish that you get to know this perfume house and do not want to influence your preferences)… admiration, inspiration, safety. Also addiction. I look forward to putting it on and have slept with it on a few occasions…and keep smelling my own skin when I wear it. Almost have to force myself to use other perfumes as those days at this moment feel slightly “lost”. It is indeed a love affair. It is with great pleasure that I dedicate a post to expressing my admiration for this Italian luxury perfume house and I do hope that it will lead to some amazing love affairs also for some of you. Pro Fvmvm fragrances are hand-crafted perfumes that are created with a mix of natural and derivative raw materials. Pro Fvmvm say, “A perfume made up totally by natural essences has a less “gentle” scent, while one based solely on synthetic substances lacks “heart”. The perfumes have a very high percentage of essences; as a consequence, when vaporizing a high concentration of oil remains. Pro Fvmvm recommend applying the perfume in the décolleté and the back of the neck by vaporizing the perfumes, waiting 10 to 15 seconds and then gently massaging the area in order to permit the essence to blend with your skin. I really appreciate and like how Pro Fvmvm inform about storage of their fragrances. Storage is so important and yet talked about so little. Every box of perfume from Pro Fvmvm has a leaflet that signals the correct way to store it. Truly handcrafted fragrances are devoid of chemical conservants and must therefore be stored away from heat and light. Fragrances for sale are therefore stored in protective cases and once bought by the customer, need to be stored away from heat and light. Direct sunlight and exposure to heat sources can damage the perfumes. Storing perfumes in the bathroom should be avoided as thermal excursion can damage the product. The best place is a cabinet where temperature and humidity are constant and the products are protected from light.